AT THE HEIGHT OF WORLD WAR II, the CIA's predecessor, the OSS, issued a classified document: the Simple Sabotage Field Manual. Devoted to disrupting institutions behind enemy lines, the document detailed acts of sabotage, like slashing tires and draining fuel tanks. But within its pages were eight methods for sabotage designed to thwart the internal processes of organizations, with tips for wasting time (e.g., "Insist on doing everything through channels") and bringing efficiency to a halt (e.g., "Refer all matters to committees"). 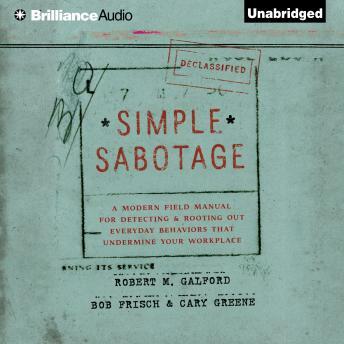 Decades later, these eight sabotage methods still lurk in our workplaces. Masked as "good" behaviors, they slow down your group's-and your-best efforts. Simple Sabotage exposes these often unintentional but highly corrosive behaviors and provides countermeasures to protect you against each one. Don't let your guard down: stamp out sabotage now!